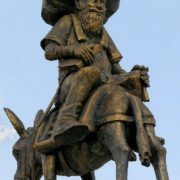 Installed in 1979, Uzbek folklore character Nasreddin Hodja monument decorates the center of the ancient and beautiful city of Bukhara. 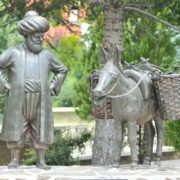 Located on the Mekkhtan Anbar street, so-called architectural ensemble of Lyabi-Khauz (“On the banks of the reservoir” in Uzbek), consists mainly of the 16th-century buildings. 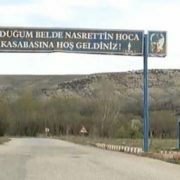 In particular, Madrassah of Kukeldash, Hanako (something like a hospice house for wandering preachers – dervishes) and the Nodir Divan Begi Madrasah, built in the 17th century, as well as the reservoir-house. 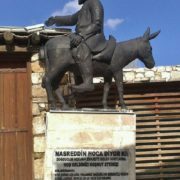 However, the modern monument to the legendary hero of folklore Nasreddin Hodja Afandi became an integral part of this ensemble. 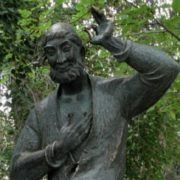 The author of the monument – sculptor Yakov Shapiro. 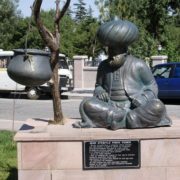 Made of bronze sculpture stands on a rectangular pedestal. 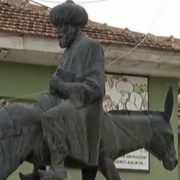 Nasreddin Hodja is sitting on a donkey, and his left hand raised in greeting, while fingers squeeze a small coin. 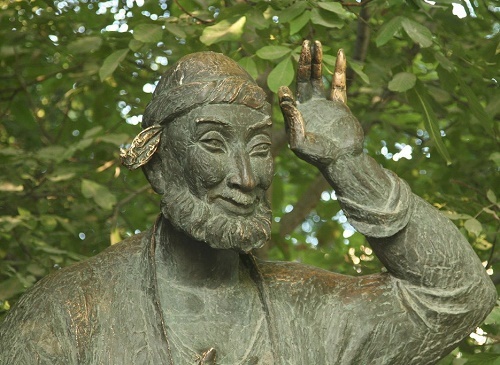 He pressed his right hand to the chest, on the head – the skullcap, and a cunning and kind smile is on the face. 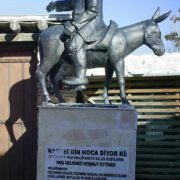 Meanwhile, Nasreddin Hodja is the national hero of Central Asia and the Middle East. 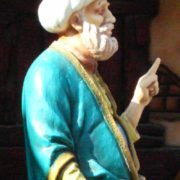 Initially, this is the image of a wise man and a simpleton at the same time. 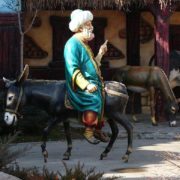 In all the parables and anecdotes, Khoja finds a way out of the most delicate situations. He masterfully mastered the word, and often confounded his interlocutor with absurd, and at the same time wise statements. 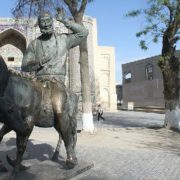 Meanwhile, Bukhara is the birthplace of Nasreddin Hodja, and accordingly, his image is surrounded by a huge popular love. 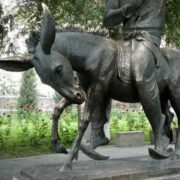 By the way, it has become the tradition to rub the donkey to make your wish come true. 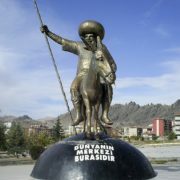 It is believed that Khoja Nasreddin died in 683 AH (1284 AD) in Akşehir town of Konya province, which is on the shore of the lake of the same name. 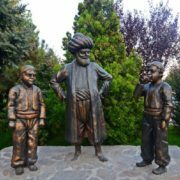 Here is his grave, and from 5 to 10 July Khoja Nasreddin festival takes place, during which are played jokes from his life, and people just have fun. 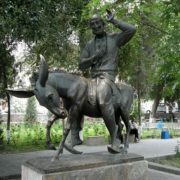 And in the city, of course, there are monuments to Khoja. 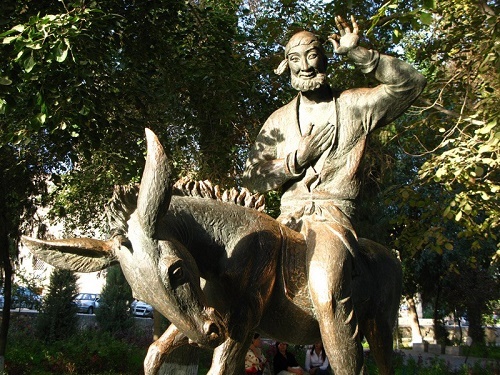 The city is simply filled with monuments to Khoja Nasreddin and heroes of stories about him. 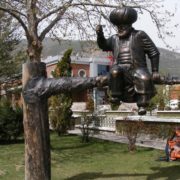 Especially a lot of them in the so-called Humor Park of Hodja Nasreddin (Nasreddin Hoca Gülmece Parkı). 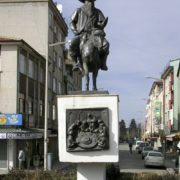 In 2013, was a broad reconstruction of this park and sculptures unfolded there, 13 pieces were put there exactly, this is not counting those that were put around the city and those that were already standing there. 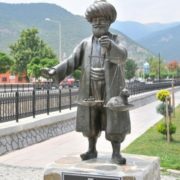 It is difficult to find out any names of the sculptors, but, it seems, they say that at least a few sculptures were created by sculptor Cemil Güntepe.